errors due to change in frequency. Zero Error. In this case the output deviates from the correct value by a constant factor over the entire range of the transducer. This is shown in Figure. Sensitivity Error. Sensitivity error occurs where the observed output deviates from the correct value by a constant value. Suppose the correct output is qo, the output would be Kqo, over the entire range of the transducer, where K is a constant. Non-conformity error. This pertains to a case in which the experimentally obtained transfer function deviates from the theoretical transfer function for almost every input. In the special case of a theoretical linear relationship between input and output quantities, this error is called non-linearity or non linear distortion. Hysteresis. 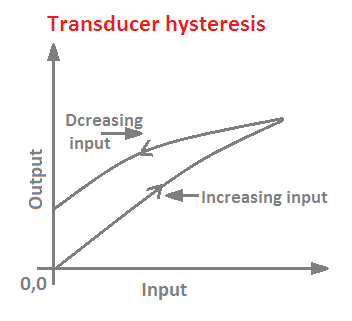 All transducers are subject to the effects of hysteresis. 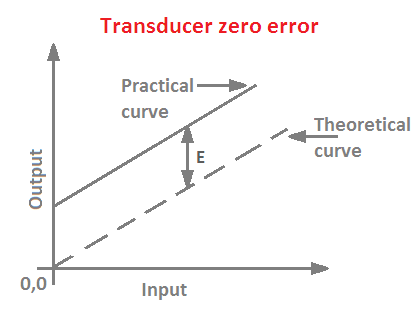 The output of a transducer not only depends upon the input quantity but also upon input quantities previously applied to it. Therefore, a different output is obtained when the same value of input quantity is applied depending upon whether it is increasing or decreasing. For decreasing values, the greater output is obtained than with increasing values for the same values of input quantity. Dynamic errors occur only when input quantity is varying with time. This is on account of the fact the system contains energy storage elements like capacitors and inductors and due to this the output cannot follow the input exactly but with a time lag. It should be noted that the dynamic error is function of time. As the time after application of the input increases the dynamic error reduces. Noise and drift signals originating from the transducers vary with time and are superimposed on the output signal. The difference between noise and drift is that noise consists of a signal of random amplitude and random frequency whilst drift is a slow change with time. The magnitude of the noise and drift is normally independent of the magnitude of the input signal. Frequency response and the high frequency cut off are the two specifications that describe the response of a transducer to a variable frequency sine wave input applied to it. For a reasonably, linear transducer, a sine wave input yields a sine wave output. 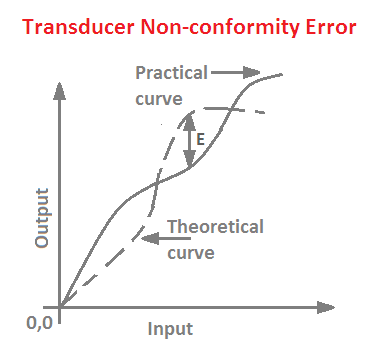 As the frequency of the sine wave input is increased, the transducer is required to respond more and more quickly. Ultimately, beyond a particular frequency the transducer can no larger respond as rapidly as its sinusoidal input is changing. So the output of the transducer becomes smaller and also the phase shift between the input and output increases. Thus as the frequency increases the output of the transducer falls. This fall off of amplitude of output with an increase in input frequency is the frequency response. 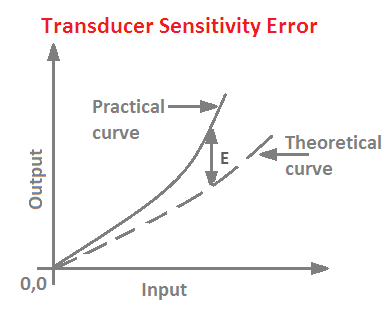 Thanks for reading about “types of errors in transducers”.